In the autobiography I will never write, a chapter will surely be devoted to the dogs of my life. From the Jack Russell who used to push me around in a trolley when I was a baby, to the cross breed rescue dog my wife and I got as an obvious, but unbeknown to us, trial run for having a child of our own. 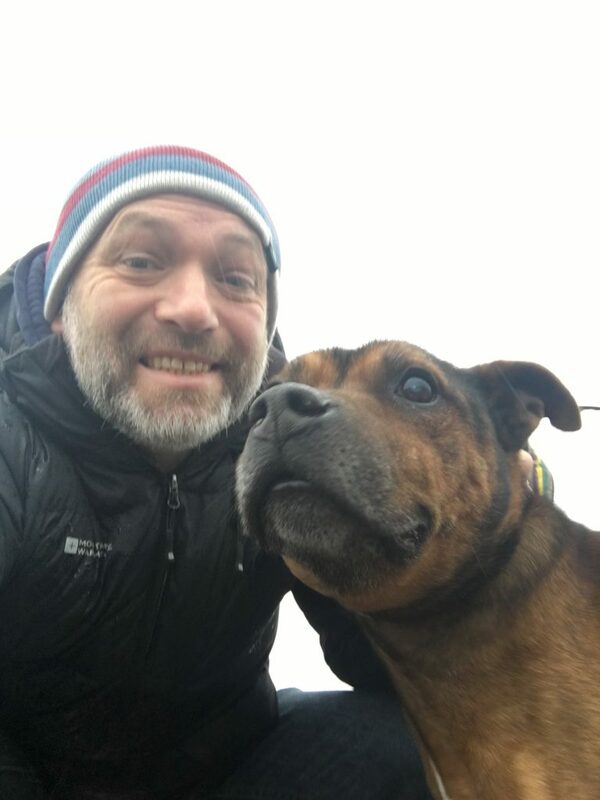 Amongst these, standing as the most loyal and singularly devoted, will be Bruno, the Staffordshire Bull Terrier I adopted from Cardiff Dogs Home 3 years ago. As some of you may know, this was just after my divorce. I wasn’t sure I could manage a dog on my own, but the inevitable pain of marriage breakup had been exacerbated by losing a previous dog to cancer and sharing custody of Pip (who peeks out in the banner of this blog). So, I opted for an older dog that might not need as much attention as a pup. 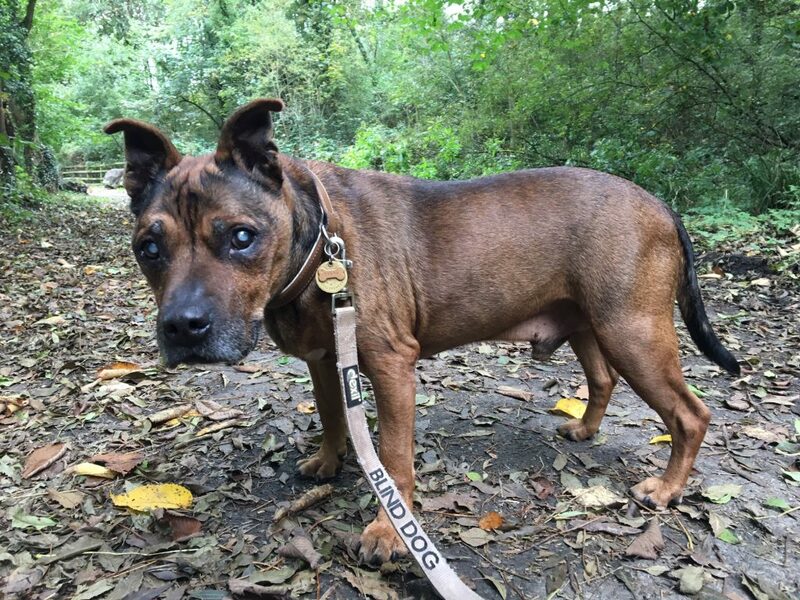 Bruno was 11 years old, and had been in the home for over 6 months. He was a bit deaf, and being a Staffie, not a very popular breed for people with children. They didn’t know anything about his past, but there was some signs it hadn’t been a good one. A couple had adopted him previously only to be approached by two menacing blokes who insisted he was their dog and they should return him immediately. Feeling intimidated they took him back to the dogs home, only for the declared owners to leave him there unclaimed. So he languished in the kennels for months. An old fella who found himself unwanted, in my self pitying state it felt like a kindred spirit. And indeed he was, we enjoyed doing the same things – eating, napping on the sofa, snoring, going to the pub. From the day I brought him home, he never wanted anything else other than to be by my side. I would work and he was there by my feet, I watched TV and he curled tightly in next to me, in the morning I was awoken by him bashing the door open and jumping on the bed. I had never considered owning a Staffie before, put off by their reputation as the drug dealer’s dog of choice. But like most Staffies he loved people, wasn’t too bothered about other dogs and was an ideal pet. I made a deal with him on the day I adopted him, that I was at home most of the time but he would have occasional longish days on his own (or with a dog walker) and he would go into kennels when I went away. It may not be perfect, but it was better than being in the dog’s home. He assented to the terms readily, and was never a problem (apart from that time he ate a tub of Quality Street, but we can overlook that as it was Christmas). My dog walker regularly left me notes about how much she adored him. Last year he suffered two strokes, when he lost the use of his back legs, and his remaining sight. He recovered his ability to walk (if prone to the occasional collapse), but was now completely blind and deaf. But, as long as he had a slow walk every day, and could find me in the house, he was happy enough. Unfortunately his condition deteriorated, with a form of dementia setting in, occasional vomiting, passing blood. He became increasingly anxious without me, even if my daughter was with him, would become lost in the house, wake up in the night in distress and forgot his toilet training. I spent the last 6 months working downstairs on the sofa so he could be next to me and settle down. At ALT-C I got a call from the dog sitter that he was very distressed and I ended up having to commute to Manchester daily so I could be with him at night. Any one of these complaints in isolation was manageable, but ultimately it was the burden of their relentless accumulation that sapped his spirit. So, at the end of last week I made the decision to have him put to sleep today. A definite date is a terrible knowledge to possess, ticking off his last night on the sofa, his last meal, like a macabre advent calendar. And today I took him on his last walk and said goodbye. It was time I think, as Howard Jacobson says in his piece The dog’s last walk, he had the sense of “something once strong ebbing from him, the dignity of his defeatedness.” It was an exclusive relationship – he was the first dog that was truly mine alone, and I was the only human he was remotely interested in. He fulfilled an important role for me, and helped me transition to a new, contented phase in my life. In return, I like to think I gave him three years at the end which removed the stain of mistreatment and rejection that had preceded it. I hope that was a fair exchange. Wow, well told, and a fair shake all around. Arrivederci Bruno! Beautiful, moving and sad Martin. In tears at my desk. You did him proud and vice versa. Sincere best wishes. Many thanks for the comment Mark. we loved Bruno. thank you for sharing him with us – and with Posey esp – when you shared your home. he made a big difference in her relationship to dogs. and you & he clearly loved each other deeply…it was a beautiful thing. big love to you, and farewell, Bruno. you were a good boy. That’s a lovely comment, many thanks Bon. He didn’t meet many children, so I was very happy he got to spend time with O and P.
Hi Grainne, thanks very much for the kind words. Very sad. I still remember Mutt’s last day, over 7 years ago now. But it was the right decision, and he died in the company of the people he knew best and a very kind vet and vet’s assistant. Thanks Viv, yes he contributed to many a skype call through a variety of snoring and deep breathing. Very moving evocative Martin. Thanks for sharing. So sorry Martin, never met him but can fully appreciated the mutual bond you had and rench of having to prise this apart. Must congratulate you though; making an animal happy and content, a very good thing indeed. Read Bruno’s let walk whilst listening to Villagers. That was test in itself. Deeply moving reflection, Martin. You and Bruno were well met; fortunate in each other. Thank you for sharing that good fortune with us as well. And thank you for giving Bruno what we all would long for: a proper farewell, and a loving eulogy. Hi Gardner, that’s a lovely comment, many thanks. Thank you for sharing your story, Martin. I am in awe of your dedication and will give my two older pups an extra squeeze tonight in honor of Bruno. Hi Audrey, many thanks – squeeze them pups tight! I only knew Bruno from your pictures on Instagram and such but always recognized him in your posts. So sorry to hear of your loss – thank you for sharing with us the good times and the sad too. Many thanks Autumm, hope you are well. So sorry to hear Martin. A horrible time, losing a canine friend. Hi Martin! Sorry to hear about your loss and thank you for sharing! A very moving and beautiful post! I remember going to the vet three years ago with Spacey, our 14 year old Bearded Collie and how I cried my heart out saying goodbye. I’m sure that the last three years did exactly as you wrote and that it was much more than a fair exchange. Sounds more like meant to be to me. All the best from Sweden! Hi Jorg, many thanks for your comment, yes it was very emotional. Coincidentally, I took two days off after to go to Vaxjo to see hockey which helped take my mind off it. Wow, that is dedication and perfect timing, indeed! You must have had a blast when Hedden opened the scoring! Unlucky it didn’t go all the way! As cliche as it sounds, I feel your pain. There is little that truly compares to having to make this call. Damnit. Thanks too for sharing the depth of your connection to Bruno, and I’m n awe of how you gave a dog no one seemed to want noth a home and love. Another meetup arranged for Rainbow Bridge. Sending some good vibes from me and Felix.